Insight Communities - panel för dina kunder! Understanding customers is critical in today’s business world, and there is a never-ending supply of data to access in order to help. But how do you progress from gathering data, to creating a real-life, data-driven customer-centric business? One of the easiest ways is to create an ‘insight community’, which is simply establishing your own panel where you can interact with your customers to both understand what they want, and inform them about what you have to offer. 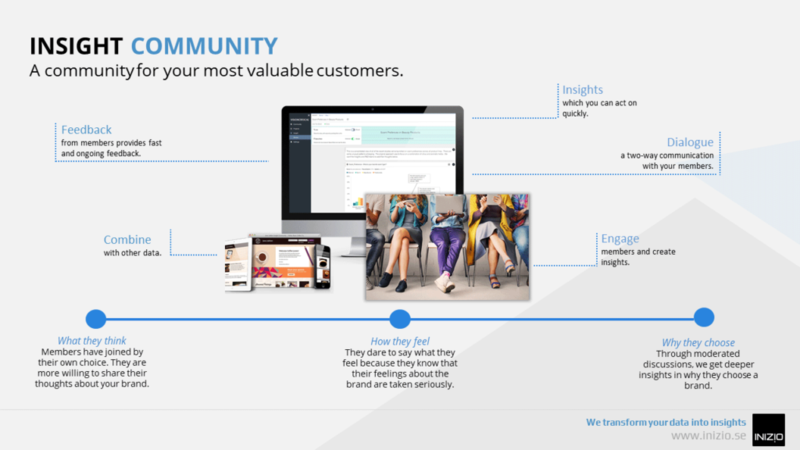 As opposed to a regular panel, the goal of an insight community is, however, not only to find out figures, but to drive a continual dialogue with your customers to both improve the relationship with them and develop your business. Based on the customer contacts that a company has online, we can easily build your own insight community. Using our expertise, and our technical platform, you can ask questions, test concepts and interact with the group in various ways in order to better understand your customers more quickly and efficiently. It is easy and fun for the customers, whilst at the same time it is quick and efficient for you. But isn’t it just another panel? An insight community differs from a regular panel in a number of subtle ways. In the same way as for a panel, a company can put questions to the members. However, with an insight community you can also conduct a continual dialogue rather than “just” putting questions and getting responses. The customers’ involvement is encompassed by putting follow-up questions and allowing them to interact through chatting, sharing images and talking with each other under the supervision of a moderator. It’s a fast-moving process that creates participation and conditions for even better decision-making. It is as if the members become part of the corporate management team.